ABOUT STUART, FLORIDA: Stuart is situated on Floridas central Treasure Coast on a peninsula that juts out into the St. Lucie River. This compact little town has a remarkable amount of river shoreline for its size and also a charming historic downtown district. The ocean is approximately 5 miles east of town, offering lots of recreational options. Deep-sea charters are available for fishing excursions, swimming, kayaking, golf, tennis, and hiking are just a few of the activities this beautiful area has to offer. In Stuarts historic downtown you will find a delightful assortment of antique shops, specialty shops and restaurants. A self-guided walking tour pamphlet is available at assorted downtown locations. The old courthouse has become the Cultural Court House Center and presents art exhibits. A lovely gazebo at the restored Lyric Theater offers free music performances. The B&B Flea Market is the oldest and largest on the Treasure Coast and has a street bazaar feeling to it, where shoppers can find practically anything. This quaint little town has it all. PROPERTY LOCATION: Desirable duplex, a seldom available find in the safe and friendly little waterfront community of Fisherman's Hideaway. Available as a SEASONAL RENTAL , your home away from home is a wide-water location on the South Fork of the Saint Lucie River, offering a spectacular sunset view, overlooking wide water and a natural island preserve. 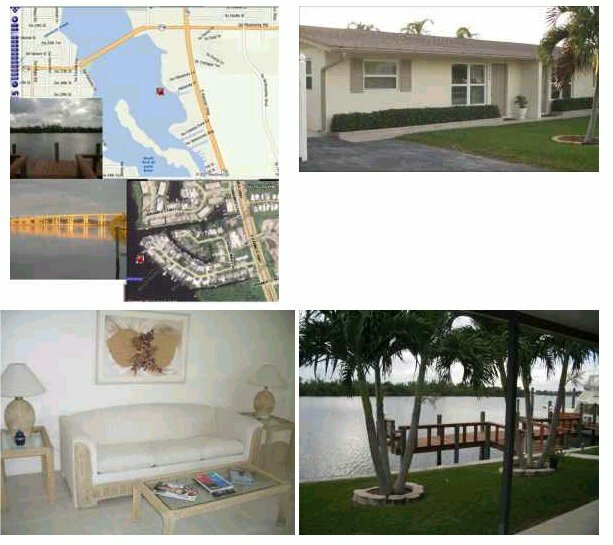 Fisherman's Hideaway is an excellent location, situated just off Kanner Highway, just 4.6 miles to Interstate 95, and approx. 5 minutes from Downtown Stuart. All conceivable amenities are available. There's a big regional shopping mall about 10 minutes away, the area offers a terrific selection of fine restaurants, as well as a variety of grocery stores, from the upscale Stuart Fine Foods to Publix, WinnDixie, and of course the Walmart SuperStore. Home Depot and Lowes are both minutes away as well. There are two full scale medical facilities within 5 minutes drive, Martin Memorial Hospital and Martin Memorial South. Witham Field, a private airport offering chartered flights is 5 minutes away, and Palm Beach International Airport is only about a half hour's drive from the Kanner Highway entrance to I-95. STRUCTURE & CONDITION: Situated on a quiet cul-de-sac, the building is CBS construction, newly updated, landscaped, and in spotless condition. Newly updated dock and seawall. The area is serviced by Martin County Utilities, with city water & sewer. 140 S.W. Hideaway Lane is FULLY FURNISHED, a 2+ bedroom 1 bath residence with 11' x 18' Florida room and covered 23'x 10' concrete patio plus DOCK with dimmable lights, water, and a built-in dock seating area. The home has Cable TV and Wireless Internet Access, Central Air & Heat, ceiling fans in every room, and for your pleasure, a propane grill on the patio. There is a fully equipped Eat-In Kitchen with Electric Range, Refrigerator/Freezer, Microwave, Blender and Electric Coffemaker. A spacious tiled laundry room off the kitchen is also equipped with a stacked Washer & Dryer. Furnished in neutral tones, the home has a combination of newly installed tile and new carpet flooring. The master bedroom has a king sized bed, the second bedroom has a queen sized bed, and the larger of two living room sofas is also a convertible couch, which comfortably sleeps 2. There is a television and stereo in the living room, and TV's in each of the bedrooms. An affectionate gray guard-cat with fur like velvet will likely patrol your dock and patio from time to time. BY APPOINTMENT ONLY, PLEASE CALL OWNER AGENT AT: 772-631-5595. Please put the words "GO FISH" in the subject line of your email message to ensure a fast response.